Round(0.75*(0.175*(38.1+2.3375*D+0.01125*D^2))) SP per turn. If you cannot pay, he disappears. You can click on his head to see how much SP he costs**. If you are in a DragonSlayer armour, then the cost is 67% of the above. If you are in any other armour, the cost is 125% of the above. *The draykling retires from battle exhaused. **At his current level of activity and affection for you, the Drayk requires «» SP to maintain his energy. Against Monster Category "Dragon", the guest deals 120% Base, Random, and Stats damage. Against Monster Category "Dragonkin" or "Drakel", the guest deals 105% Base, Random, and Stats damage. Against anything else, the guest deals 90% Base, Random, and Stats damage. Against Monster Category "Dragon", the Element is Fire, Harm, or Void, to whichever the monster is weakest. If the Element is Void, then the damage is doubled. Against Monster Category "Dragonkin" or "Drakel", the Element is Fire or Harm, to whichever the monster is weakest. Stats from Kalanyr (via Sora Aeragorn). Correction from fenmeisterkronos. Image thanks to JMill. Round((0.175*(38.1+2.3375*D+0.01125*D^2)))*0.75) SP per turn. If you cannot pay, she disappears*. You can click on her head to see how much SP she costs**. **At her current level of activity and affection for you, the Drayk requires «» SP to maintain her energy. Against Monster Category "Undead"/"Were" AND "Dragon", the guest deals 125% Base, Random, and Stats damage. Against Monster Category "Dragon", the guest deals 115% Base, Random, and Stats damage. Against Monster Category "Undead"/"Were" AND "Dragonkin"/"Drakel", the guest deals 110% Base, Random, and Stats damage. Against Monster Category "Undead"/"Were"/"Dragonkin"/"Drakel", the guest deals 100% Base, Random, and Stats damage. Against Monster Category "Dragon", the Element is Light, Harm, or Void, to whichever the monster is weakest. If the Element is Void, then the damage is doubled. Against Monster Category "Dragonkin" or "Drakel", the Element is Light or Harm, to whichever the monster is weakest. Stats from Kalanyr (via Sora Aeragorn). Correction from The_Other_Guy_27. Fix thanks to In Media Res. 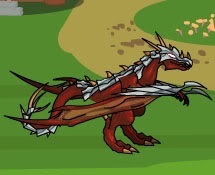 Trigger: Monster name "dragon", "drakel", "drakle", "lizard", "akriloth", "velociraider"
Clean-up from ipwnedu. Trigger from Chii.